I took this picture while touring the Whaley house (San Diego) in October of 2005. I never noticed anything at the time, but looking at my pictures later (taken by my cell phone) I have often wondered about this one. Near the bottom left seems to be a girl's face with dark hair outlining it. I wish I could go back and compare it to what is in the room. I can't tell if it's the shadow of an object within the room or indeed an apparition. The whole photo seems a bit hazy with low definition so it's hard to tell. What do you think? 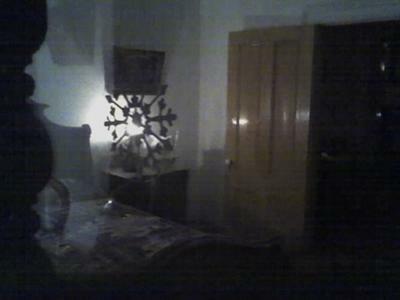 I just was at the Whaley house on Halloween night and I got a very similar pic downstairs through the kitchen window, but it looks like it is holding a doll or teddy bear. I thought that I was crazy but seeing your pic makes me think it is real. What you have is a reflection from the glass. It happens a lot there. I will have to post some of my pictures that I took on the After Hours Tour. All the rooms were open so there was no reflection. When I went I felt like a little girl was pulling my jeans and I heard like crying coming from violets room but awesome. I went there with my mother when I was maybe 17. In the hallway that leads to the stairs(when I went the stairs we blocked and you couldnt go up)where they say on the 9th step people feel chills and I recall them also saying at the top of the stairs people have felt a pushing sensation..anyway the hall way was pitch black, i snapped a picture of my mother walking toward me with the flash on. We didnt see anything until maybe a month later my mother was going thru all the pics and noticed an outline of a figure. When we enhanced and enlarged the picture you could see what apepard to be a hazy skeleton figure. You could see the skull/head on top, arms and forearms hanging to the sides, a spine leading down to a pelvis under that femurs and shins. Outside the courthouse in the back yard I took two pictures of a bush with the flash on while standing still and the camera started acting funny. Later when we reviewed the pics one picture was bright green and the other was bright purple..there were only the flash from the camera and dim porch lights. Really awesome place! I was stationed in San Diego and had the opportunity to visit the Whaley House. My friends and I went late one night just to walk around(cause we knew it was supposed to be haunted) and I will NEVER go back there! My friend and I looked up at the side upstairs window and there was someone looking back at us!!! It was after midnight when we were there. My friend took a pic on her camera & we left. Quickly. When we got home and d/l the pic, I pulled up the internet and lo and behold....we got a pic of Mrs. Whaley. That place still scares me! i'll see if my friend can send me her copy of the pic and I'll post it. That place is really creepy! You took an awesome pic! I do like the fact that you didnt jump to the assumption that this was in fact paranormal. As an investigator (a good one) I try to debunk absolutely everything and if I am left with something unexplainable than yes it could very well be paranormal..
On this note I do agree with the last post that it is just the light passing through and possibly a little bit of matrixing. The light and the reflection make an unknown shape so your mind tries to make something of it that is known....such as a face, and while I do think it is an interesting picture I can tell nothing here is faked but no it is not paranormal or a girl ghost.. sorry hun... but kudos to you! Nice try but if you look at it the "face" is light passing through the sculpture or decorative piece on the nightstand. The "hair" or dark part is obviously the shadow from said decorative piece as well. If you look at the "face" you can see the bed pattern on the right side...it's just an illustion created by the shadow on the bed. It looks strange because the pattern on the bed seems to be the "eye" even though it would be a very distorted eye...as it looks like it's on the side of her head. Also if the bed post wasn't there you'd see the shadow that makes up her hair follow the curvature of the bed as it disapates but the placement of the bedpost frames the spot of light on the bed making it appear as a face. I've been studying this picture for a while now, analyzing and changing the properties on it. And while I do agree that there MAY be some tricks of the camera used here, I don't see much "proof" of this being "faked" as so many of you here are stating. The amount of skepticism is humorous, and always the same. "It's fake" "It's just light reflections" etc... always the same "responses." However, can you hone up to any proof of something faked? I've got the same type of "surroundings" within my room, and have seen nothing of this sort. Ever. Also, note the photographer says he noticed nothing like this at the time of the photo, but only after did this take shape. This indeed could be quite genuine. Keep in mind people that there is glass there...there is no "mist" Its light reflections off the smudged glass. I was at the Whaley House today. After going there today....the "face" appears to be a reflection of the carved wood in the doorway reflecting on the glass. I most definitely believe the house is haunted but I can tell for sure that there is no face or mist in the room judging by the physical features of the room and glass. i see the face of a girl.real interesting wow kinda creepy too.and i see the mist to thats a good capture. If u look near the lamp u can see the tail of the "thing". WEIRD HUH?! i see the girl but i also see something else, might not be anything, or like the've said before, "people see what they want to see"
Well this photo is pretty creepy but I am always up for a good scare so if you have any other stories, do share!!! Well I see what you mean... This is a very creepy photo but I am on this website 24/7 and if you have any other interesting stories please to share!! This pic surely is interesting. However, being that it is so low resolution, that could be anything. Also, without see other pics of the room, it's hard to tell if you picked up a piece of furniture or something. It could also be someone standing beside you. But it is interesting. Thank you!